After the Odery CafeKit first caught my eyes some time ago, I’ve been looking forward to the opportunity to check one out. 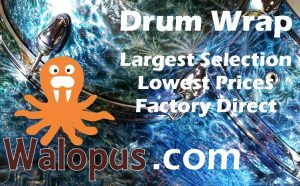 There aren’t a whole lot of choices in the market with a 14″ bass drum. It’s really limited to just two; Odery’s CafeKit and the little Sonor Martini. There are more differences than similarities between the two though. Rather than follow the beaten path and simply “shrink” a regular bop kit to smaller proportions, Odery have quite successfully re-invented the compact drum kit from the ground up. More on this in the “Construction and Design” section below. One of the first things to get noticed is the value. At a Street price of merely US$399 including hardware, the Odery Cafekit is quite aggressively priced, especially after reviewing all the specs and what’s included. We’ll get into this in more detail in the “Value” section below. We’ve been tinkering with the CafeKit for about a week before writing a single word of this review. 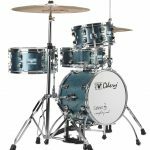 Testing the tuning range of each drum, Experimenting with different heads, Configuring and re-configuring the setup and examining the quality and tolerances. We simply can’t seem to stop probing and playing it for long enough to get started, and that’s a good thing. 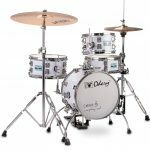 This might be the kit that has captured our attention the most of any drum kit ever scrutinized here at CompactDrums.com. The shallow “Extra Fast” toms are great for portability and allow for a very single-plane type setup while surprising all of us with their tuning range and full, rich sound. 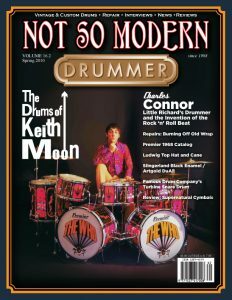 This is in stark contrast to most of the other compact bop kit’s rather deep toms. -Something assumed as necessary to compensate for the small sizes. Odery proves to us that this apparently is not the case. More on this in the “Sound, Voice and Tone” section below. 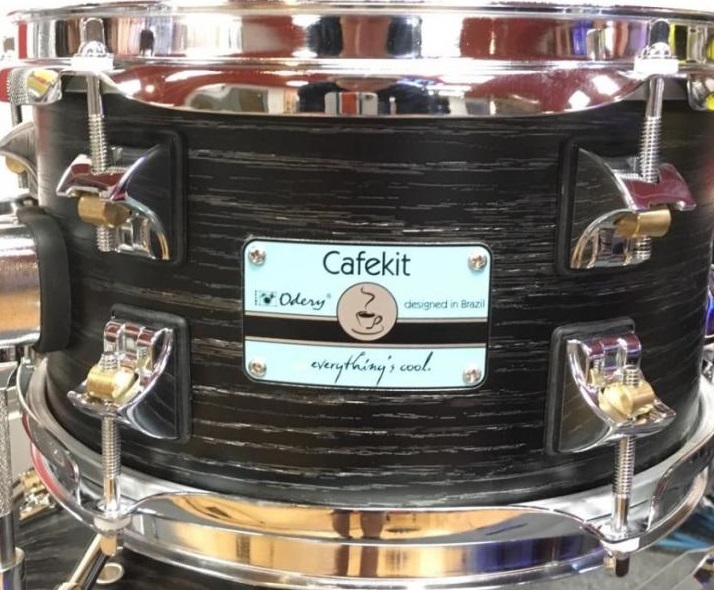 Another detail that sets the CafeKit apart from the pack is the ability to add an “Expansion Kit”, consisting of a 20″ bass drum and some hardware that converts the 14″ bass drum to a floor tom. 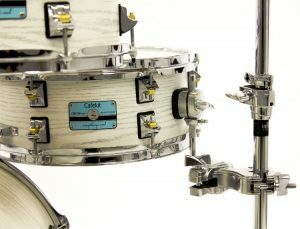 In this configuration the existing tom mounting hardware becomes auxiliary mounts for cymbals or percussion. Read on to see how versatile this little kit really is and how it stacks up against the competition. Like a pack of candy-fueled six-year-old kids on Christmas Eve, we tore into the single box that contains the entire CafeKit and included hardware. The contents are well packed with ample cushioning material and sturdy cardboard boxes. No assembly is required for the snare drum and toms, while the bass drum does require installation of the heads and rims. Of course the unusual lug design is immediately noticed along with the finish and unorthodox tom mounting hardware. The lugs with their “open concept” design are more than a gimmick, they function very well and allow for rapid head changes by flipping the lug nut sideways out from the lug casing. Cool aesthetics are an added bonus. An almost “silvery” shimmer in the grain portion of the Ash design makes the wrap finish look a lot better in person than on picture. The wrap is fully adhered to the shell rather than just attached with adhesive strips at the seams. Something not usually observed on entry or even mid-level drum kits. Setup is straight forward and went without hiccups. I was expecting the ratcheting cymbal-stand-style tom arms to be somewhat limiting in regards to available angles but this proved not to be the case. Quad spurs on the bass drum keeps everything solidly planted even with the floor tom mounted to the bass. We weren’t expecting to find eight lugs per side on the bass drum and small snare drum. 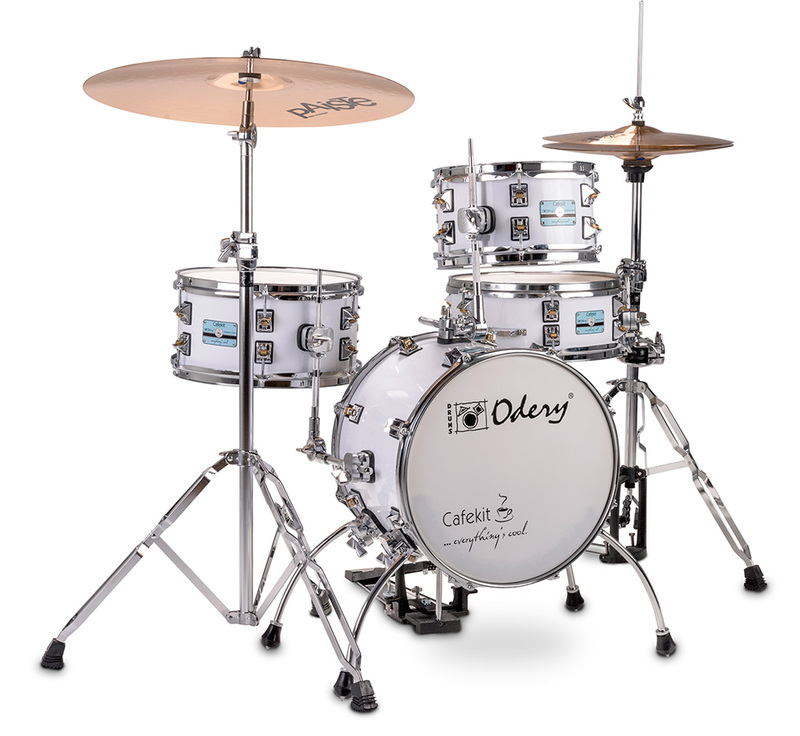 Often we find only six even on 16″ bass drums. Screwed-in badges, Hinged Brackets and Isolation Gaskets are other features that are rarely, if ever, found on budget priced compact kits. We liked that the batter heads are all coated and the bass drum comes with coated heads for both sides. There is no damping of any kind on the bass drum heads. More on this in the “Sound, Voice and Tone” section below. Normally we discipline ourselves to measure tolerances and inspect the internals before setting up the kit. This time though we took the kit through it’s paces for a few days before removing all the heads and rims to perform the boring and tedious task of measuring the discrepancies of roundness and “trueness” of bearing edges. Tolerances fall well within expectations for the price-range. The largest discrepancy in roundness is 1.5 mm and the the most “untrue” bearing edge measurement is well under half a millimeter. Both were found on the bass drum. The other drums were all even closer to perfect. 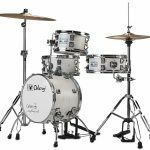 These are excellent results for an entry level kit and would be acceptable even on semi-professional, high end drum kits. A visual inspection of all metal parts does not reveal any flaws. All threads, hinges and other moving parts function without rough spots or other imperfections. The screws holding lugs and brackets to the shells are all torqued evenly. In short; there is nothing to criticize in regards to component quality or assembly. Every part and it’s installation, is of consistent, good quality. When considering each design aspect of the CafeKit, it’s obvious that the unusual details aren’t coincidental. Neither are they compromises for the sake of cutting cost. Each of the CafeKit’s steps away from the beaten path serve a specific purpose, if not numerous specific purposes. The entire construction is well thought through and a perfect example of when the whole is greater than the sum of it’s parts. Initially I expected the tom mounting arms, (that resemble cymbal stand tops) to feel like a compromise, but as it turns out they function as well as any other tom mounting method and double as cymbal or percussion holders if the kit is expanded. 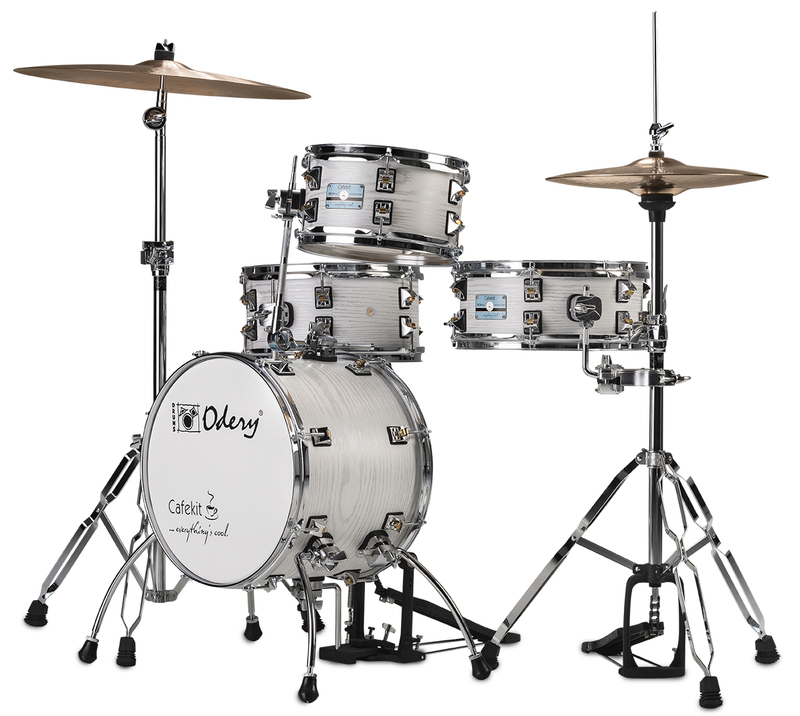 The “ultra-fast” tom sizes, snare drum holder and tom holders all add to the overall portability of the kit. 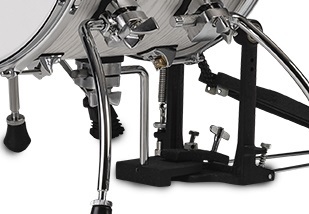 Mounting the snare on a ball-joint tom holder from the Hi Hat stand further reduces the overall package. The unusual lug design gets positive remarks for the visual impression from just about everyone that’s passed through while reviewing the kit. They also function very well, keeping the total mass low while accommodating quick head-changes by simply loosening the tension rod and flipping the lug nut out from the lug casing. While the bass drum riser design doesn’t allow for height adjustment, it’s nimble, functions well and the fixed height is right where I would have adjusted it regardless. More than an afterthought, the Expansion kit was designed right at the beginning of the design phase. The many brackets on the 14″ bass drum double as percussion and cymbal mounting brackets when the bass drum becomes the floor tom. 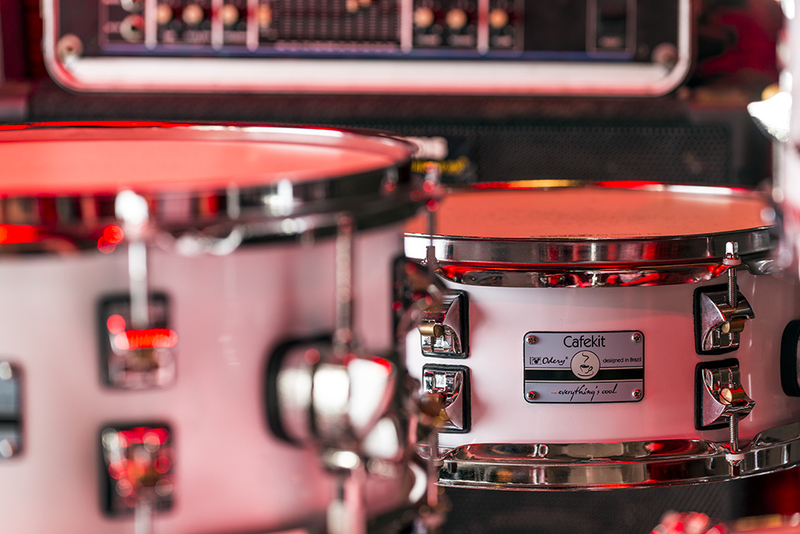 It’s easy to suspect that the shallow toms will sacrifice tone for size, prioritizing portability over sound quality. However, as we highlight in the following section, Odery have managed to combine svelte dimensions with a full, well rounded voice boasting both ample volume and articulation. Most budget priced kits utilize poplar for the shell material which balances cost with volume, if not broad range. Basswood is generally a smidge costlier than poplar but lends itself better to deeper, fuller tone, if even at a slight sacrifice in terms of clarity and definition, both of which Odery somehow have managed to overcome. Another positive feature made available by the shallow rack tom is the ability to set the kit up with all the drums nearly in the same plane. “We became even more excited, because we could instantly see the logo, the cup, and everything was coming into place. “Made of 100% basswood, with beautiful see-through new lugs, ergonomic hardware that is easy to handle. When coupled with the expanded set, the tom holders become arms for splash cymbals or percussion accessories. In other words, a drum kit for everyone, versatile and full of charisma. That is Cafekit. This is the fun part of the CafeKit. We were all instantly blown away by the sound capabilities of these modest little drums. 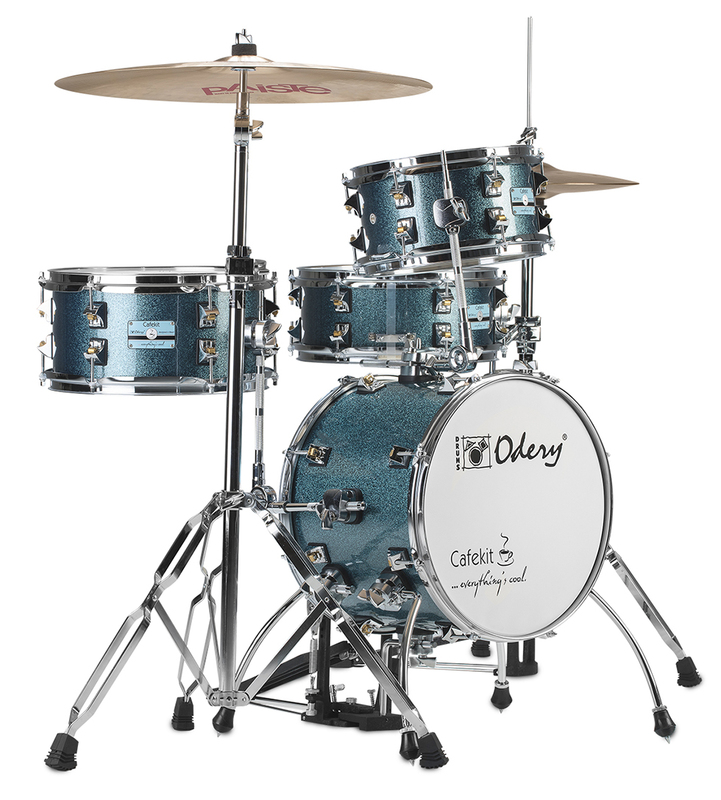 Truly a wolf in sheep’s clothing, Odery’s CafeKit can hang with the big boys in both volume and fullness. I’ve always had a fondness for shallow toms but have mostly found them a tad trickier to tune. This however, isn’t the case with the Cafes. They tune just as easily and quickly as deep toms, whether aiming for low punchy tuning or high, ringy resonance. The included coated heads are a perfect match with the shells. I can’t even think of a set of coated heads that I would consider an “upgrade”. We spent the bulk of testing and playing the CafeKit with the stock heads but they happily adapt to a rockier style with two-ply clear heads too. Overall we’re impressed with how these small sized drums are able to keep their range even when tuned as low as they’ll go. They don’t have that tendency to sound “exhausted” or “thin” but rather proudly punch out the beat with authority. 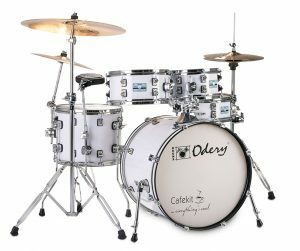 These basswood shells excel at reaching way down the tonal range while still challenging bigger drums in terms of loudness. The biggest surprise is the bass drum. I can’t help but compare with Sonor’s Martini. My experience with the Martini is at best managing to get a sound that resembles an overdriven subwoofer. 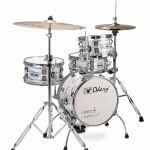 The Cafekit’s bass out of the box already promises unexpected deep bass, but the two single ply, coated heads without any muffling or dampening tend to sound quite ringy. Of course this may be suitable for certain music styles but I had to find out if we can wring out some punchy rock-thump as well. I cut the collars off from an old snare batter head and then cut a circle out of the center, leaving me with a 1-1/2″ wide donut with the flanged edge intact. add to this an additional 1/2″ donut of thin fluffy filter-foam stuck on to the mylar ring with double-sided tape. With this ring installed on the inside of the batter head we achieved exactly the sound we wanted. 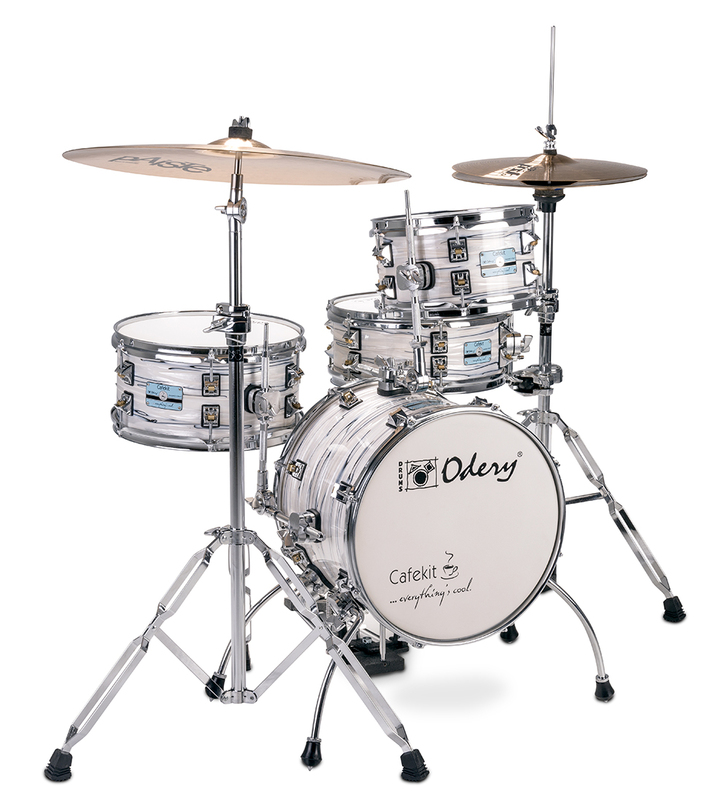 Again we are blown away by the diminutive little bass drum’s ability to punch way above it’s weight-class. It sounds like at least a 16″, maybe even an 18″ with a Super Kick II. Snare drums tend to be the least objective to attempt reviewing. Everyone has their own idea of the ideal sound. Of course the snare drum supplied with a modestly priced drum kit often ends up on a shelf and replaced by a piece from the owner’s artillery of more snappy, cracky, or tight and dry weapons of choice. 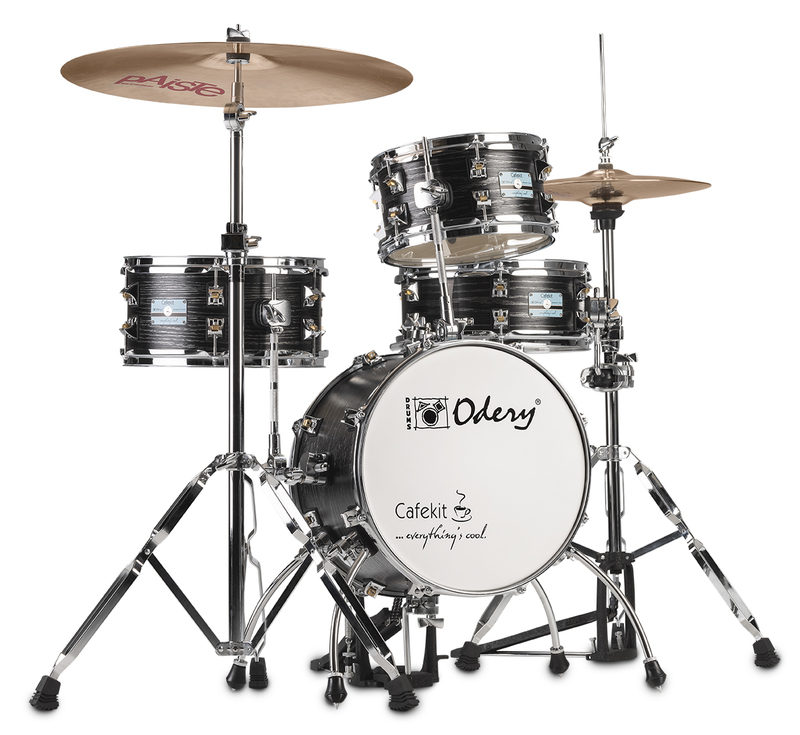 Odery’s 12″ snare is in my opinion quite useful. It is quite neutral for it’s small size and blends in more than it stands out. It sounds best tuned right in between middle and high. Tight and dry in the center while warm and “pangy” along the edge. Again, the whole is greater than the sum of it’s parts. The entire kit functions marvelously as a whole. The sizes are perfectly matched with each other serving up a well balanced mix throughout the tuning ranges. None of the drums over-dominate or fade away in the mix. Playing the Odery CafeKit brings to my attention how I often need to hold back on one or more of the pieces in other kits. 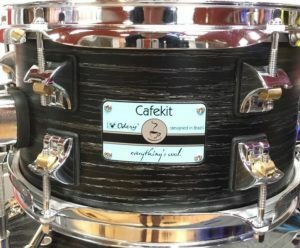 The CafeKit’s toms, snare and bass drum clearly and articulately each fill their own portion of the sound spectrum without the need for adjusting with strike-force. At USD $399 with hardware, Odery have somehow achieved value sorcery. If they have resorted to any unusual cost-cutting measures, we haven’t been able to identify them. The quality level, grade of parts, shells and flawless assembly outright defy the laws of economics at this price. If we were to borrow terminology from stock market analysts, the Odery CafeKit would get a “Strong Buy” rating. To remain in our regular vocabulary we’ll simply award it 6 out of 5 stars for value! 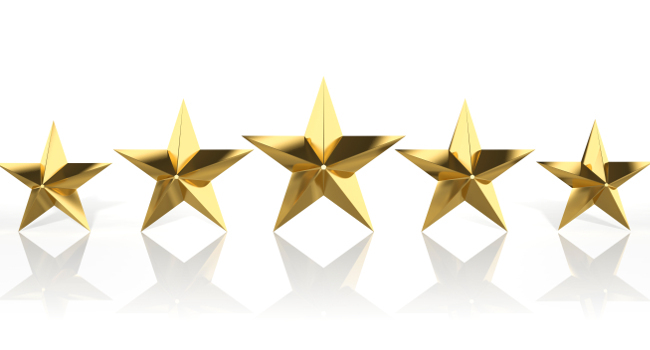 A well thought through design, coupled with unbeatable value and tone that rivals both larger and more expensive kits, add up to a rare and elusive Five-Star-Rating. Overall Odery’s CafeKit exceeds all our expectations. Whether we look at individual components or the kit as a whole we approve of every part. 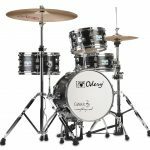 The Odery CafeKit gets CompactDrums.com’s highest recommendation.